I have entered a long trade for sugar futures. The contract was for October delivery of No. 11 sugar on TheICE exchange, as usual. Entry occurred at 10:18, my time, at a price of 19.29. This is an example of MACD divergence trading using multiple trading time frames. We will be looking first at a daily time frame futures chart, and secondly at a 60 minute futures trading chart. Here is the Daily chart for October Sugar. What we are seeing here is the MACD starting to diverge with price. The past two days have seen new lows, but the MACD is beginning to show signs that downward momentum is weak. This is an MACD divergence and offers an opportunity to enter a divergence trade. It is very good to use multiple trading time frames for these types of trades. 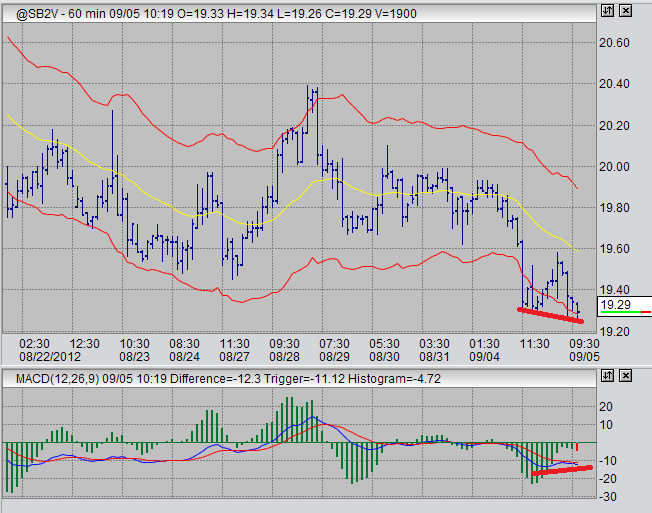 Here is the 60 minute chart that I used to find my trade entry signal using and MACD divergence. Entry was at 19.29 at 10:18. 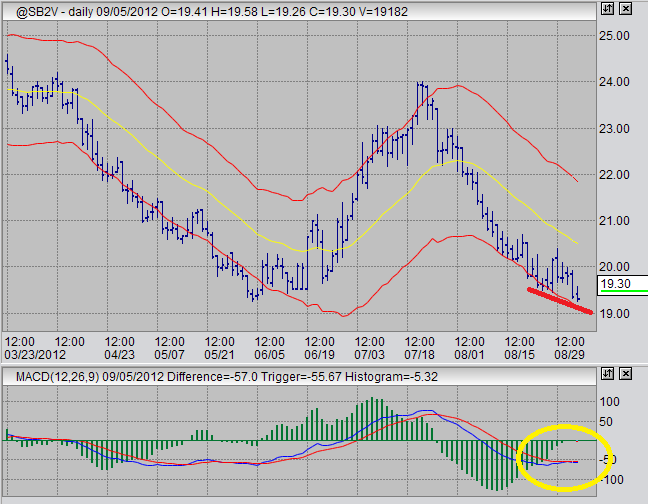 Here we are seeing another MACD divergence on the 60 minute chart. prices have made a lower low as compared to their previous low, but both the MACD histogram and the moving averages did not follow suit with new lows. This provides me with an entry opportunity to take a long position. I must mention, I have been looking for a big move long entry in this market. I don't think this is it. I am confident I will be able to get "a few hundred bucks" out of this one, but the daily chart is not indicating to me, yet, that this is the entry I've been waiting for for a multiple point move into the low 20's. Also, I am using a very tight stop on this trade. And when I say tight, I mean tight. My tolerance for loss on this particular trade is less than $100 per contract. This is exactly why I try and only trade markets that I am very comfortable with, like sugar and the USDX. I know what kind of stops I can get away with, and I know when a position has gone sour. That's why I know that on this trade, I am going to use a very tight stop.